Modern Applications of Plant Biotechnology in Pharmaceutical Sciences explores advanced techniques in plant biotechnology, their applications to pharmaceutical sciences, and how these methods can lead to more effective, safe, and affordable drugs. The book covers modern approaches in a practical, step-by-step manner, and includes illustrations, examples, and case studies to enhance understanding. Key topics include plant-made pharmaceuticals, classical and non-classical techniques for secondary metabolite production in plant cell culture and their relevance to pharmaceutical science, edible vaccines, novel delivery systems for plant-based products, international industry regulatory guidelines, and more. 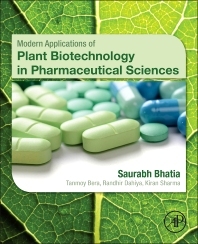 Readers will find the book to be a comprehensive and valuable resource for the study of modern plant biotechnology approaches and their pharmaceutical applications.